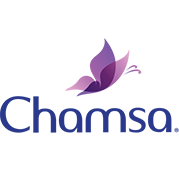 Chamsa Shea Butter & Lotus Flower for normal skin strips are based mainly on a Natural wax formula and give the skin after using, a refreshing and soft sensation. 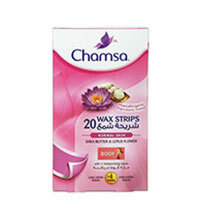 Chamsa Body Strips for Dry Skin are based on a special wax formula with Ginkgo Biloba & Almond oil extract in it. The Ginko Biloba leaves contains “Flavonoid” which is anti-aging, anti-allergic, anti-inflammatory and antimicrobial. 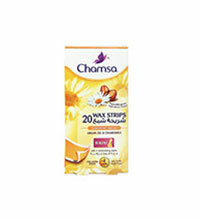 Chamsa Sensitive formula strips with Aloe Vera and Lily Flower extract in it, are based on a natural mineral wax formula, minimize dermatological allergy risks and fit allergic types of skin. 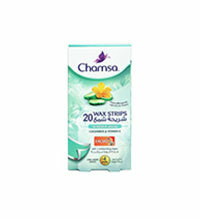 Chamsa with Cucumber and Vitamin E Strips are specifically designed for the face. Their small formats make it extra easy to use on facial parts. 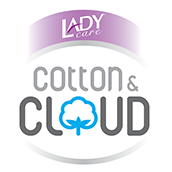 In addition, the wax formula prepared has been adapted for sensitive skin. 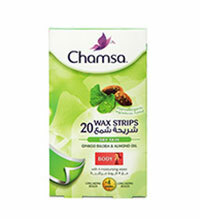 Chamsa Sensitive area wax strips with Argan Oil & Chamomile rejuvenate and revitalize the skin. 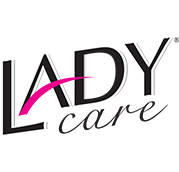 The practical size of the strip is perfect for underarm and bikini zones.